These Princess Leia Cinnamon buns are a true stretch of my imagination when it comes to the 40th anniversary of Star Wars. Yikes! Did you know that the first Star Wars movie was released in 1977? Me either and now we both feel old! At the end of this post you will be treated to a whole collection of Star Wars inspired creativity from my Movie Challenge friends. I joined a new challenge where we have to create a project or recipe associated with a movie and this month Star Wars was the movie theme that was to inspire us to get creative. Ugh! I am so not a fan of Star Wars or anything sci-fi for that matter but I am pretty creative. 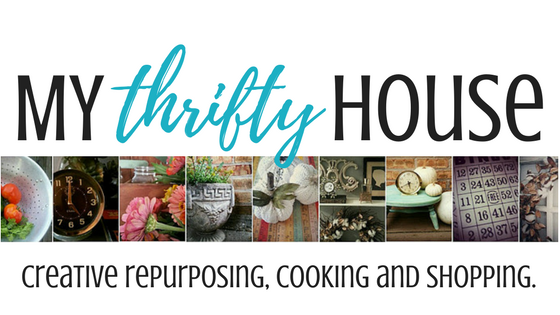 Alas, I joined this group of bloggers in hopes of being challenged and that is exactly what I got for my first round. A TRUE challenge for me. I voted for Mother’s Day movies in hopes of getting something along the lines of Steel Magnolias, Bambi or Dumbo but no such luck. Star Wars won the popular vote and I had to deal with it. So I had to think back 40 years and dig deep into my memory bank for what I do remember about the movie and just like a true girly girl I could only think about Princess Leia and her hair buns. The poor girl had a dress that looked like a potato sack but those buns made little girls around the world try to recreate her look. At least I know I tired more than once to pull off the look of those brown, twisted buns and it was a fail each time. For this challenge I wasn’t about to try and recreate that look as a grown woman but I was all about baking some Princess Leia cinnamon buns and frosting them with a healthy swirl of Nutella. Yeah, I am definitely a fan of dessert! 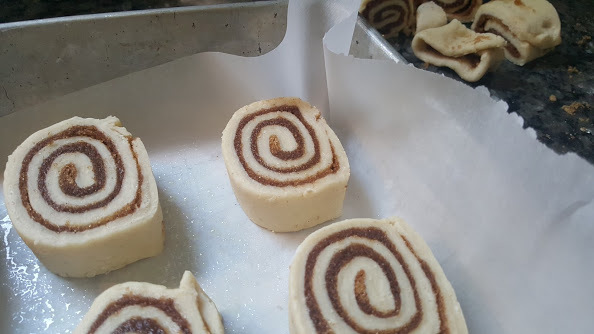 Not gonna like here….my first batch of cinnamon roll dough didn’t turn out so good and never did double in size. I am thinking that it was too cool in my kitchen or maybe bad packet of yeast. Anyway, I broke out my bread machine and the second batch rose perfectly and baked up into fluffy, pillowy swirls with a twist of cinnamon in between each layer. 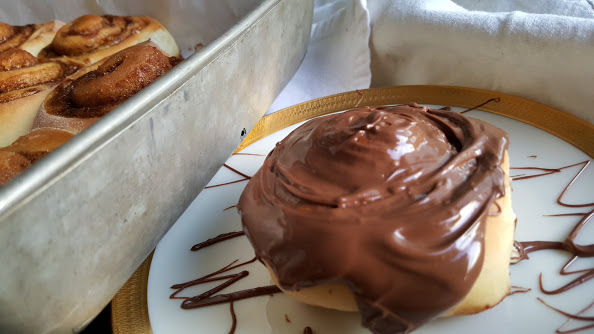 The Nutella frosting on these cinnamon buns was the perfect topping and just the right shade of brown to replicate those infamous Princess Leia’s buns. Place all ingredients in bread pan in the order listed above. Select “sweet dough” cycle. After dough cycle is complete, roll dough into a 15 x 10 rectangle on a lightly floured surface. Spread with melted butter and sprinkle with brown sugar and cinnamon. Roll dough tightly along the 15 inch side. Pinch edges of dough to seal. Cut roll into 1/4 inch slices. Place into a greased pan. Cover and let rise in warm place for about an hour. Dough should double in size. Bake in 375 degree oven for 20-22 minutes or until golden brown. 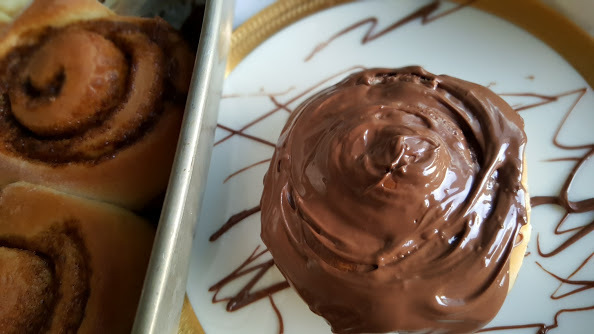 Frost cinnamon buns with Nutella while they are still warm. 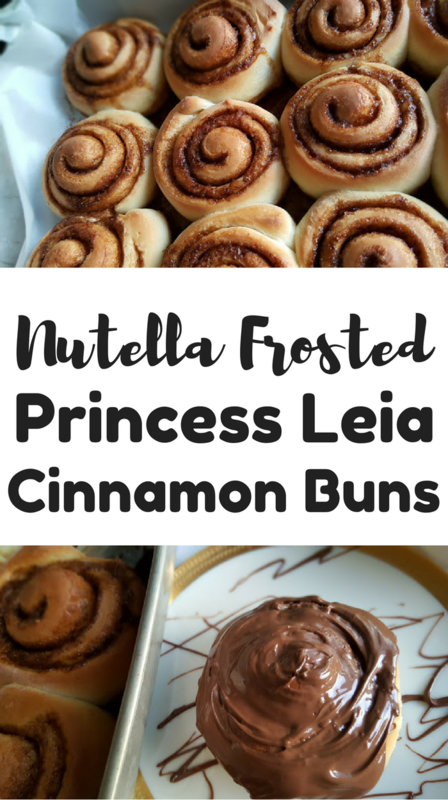 Enjoy your Nutella frosted Princess Leia cinnamon buns. This entry was posted in Breakfast Recipes, Brunch Recipes, Movie Monday Challenge. 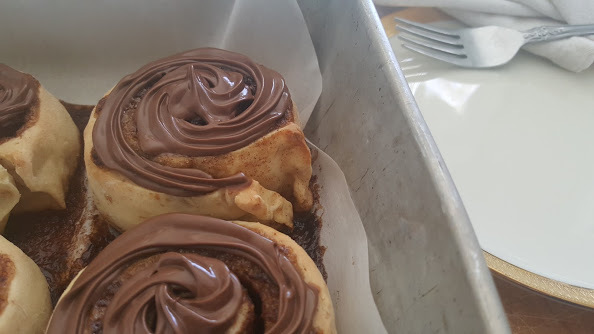 Oh man, nutella cinnamon buns! Yes! I love how you incorporated the Star Wars theme into the recipe. You made me laugh when you said you voted for a different movie this time 🙂 Great job rolling with it though, I’ve pinned these because I HAVE to try them! These look delicious!! They would be a great dessert for a Star Wars themed party. Oh these look so delicious!! This was so creative! I never would have thought of cinnamon rolls for Star Wars. But if I ever have a Star Wars party, I’m definitely making these to serve. Okay, I may have to make some today just because they look so good! Oooohhhh, Nutella on a cinnamon bun!!!!! Yum! YUM! 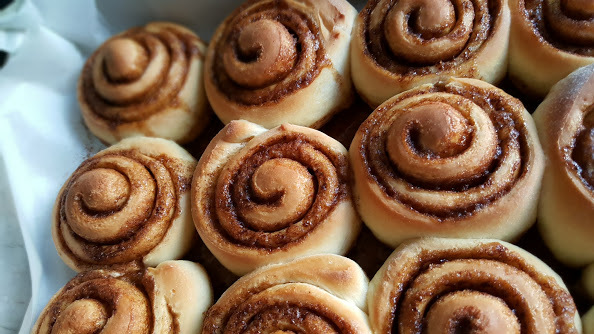 I need to run out and buy some cinnamon rolls to make these! I think the nutella was a great touch! Yum! I love your honesty! It is very refreshing. LOL! I am probably like most Star Wars fans. You love some and you hate some. But who wouldn’t love Princess Leia Cinnamon buns. These look absolutely fantastic. I think you did a great job! These look so super yummy! My family loves Nutella and I love sharing the nerdiness with them. These are perfect for both! Thanks for the delicious recipe! I love Steel Magnolias as well, but I am glad we were able to inspire you! Happy to have you in the challenge! OH MY GOSH – These looks so amazing I have to make them and soon! I’m drooling here!